Except it’s not really my 200th page, for my story is a novel in two volumes (like how Lord of the Rings is actually a novel in three volumes rather than the trilogy it’s often erroneously termed). The first volume of the story in draft form is 377 pages. That means I’m technically on page 577. The past two months has seen me achieve a number of writing milestones: my current page number; my one-year blogging anniversary on February 20; my writer’s birthday (which I actually missed) on February 10. I’m now a five-year-old writer. I mark my writing birthday from the day I began to approach my writing with a dedicated and professional attitude, and with the intention to pursue publication. This day coincides with the day I commenced my very first (shelved, someday to be rewritten) novel. I remember I started Novel #1 on a day I had karate class. I was already late leaving the house, but a great opening paragraph suddenly flashed through my head, and I just I had to type it up before I left. Not that I was planning to continue on with the novel at that particular point in time. True, I’d already made the decision to stop writing short stories, but I didn’t yet feel ready to attack something novel-length. I remember I told myself I’d just take down the opening and leave it at that – that I’d come back to it someday in the future when the time was right. Well, “someday” wound up being the following day, and the next thing I knew, by April 24, I was emailing a friend to tell him I’d just finished writing my first hundred pages. That was back in 2002. I’m only a five-year-old writer because in 2006, shortly after I’d completed volume #1 of my novel-in-progress, I gave up writing for the next six years. I didn’t write a single word of fiction during that time. Neither did I read any books or blogs about writing craft. Or edit (or even open) my volume #1 manuscript. 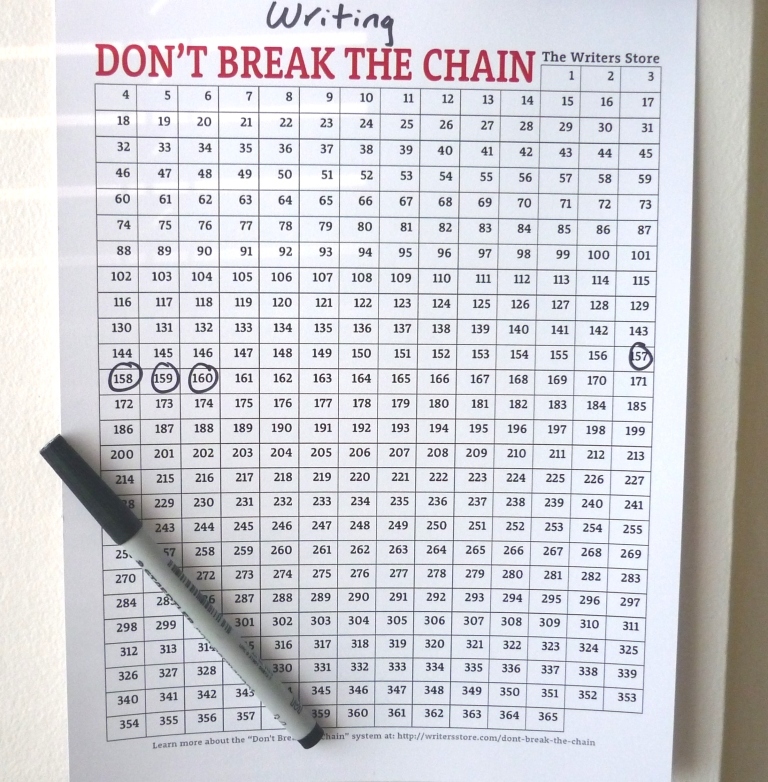 Though using the “Don’t Break the Chain” calendar incorrectly, I’m counting down the last 160 pages of my novel-in-progress. My entire writing life went into a state of suspended animation wherein the sole writerly pursuit I can truthfully claim is that I would occasionally think about my novel – about how “someday” I should write the other half and try to turn the whole thing into something worth publishing. And now, seven years and 200 more pages later, that goal feels more achievable today than it ever has in my life. This even though I still have two more major milestones to reach (page 300 and, approximately another 60 pages after that, the end of the first draft of the story). For the first time, rather than being a daunting novel that grew into two and seemed it would never be completed amongst full-time work, my protracted 400-words-a-night writing sessions, a multi-year hiatus, and my partial abandonment of the story’s original outline, I can truly foresee the day when I’ll finally type “The End”. And that day, just as I set out as one my New Year’s Resolutions for 2013, is coming this year. This entry was posted in Be it Resolved, Post series, Writing and tagged Novel, Novel writing, Page count, Writing, Writing inspiration, Writing milestones. Bookmark the permalink. That revelation (the six year hiatus) has given me great heart Janna. I have (like most writers) limited time to write, and when an opportunity arises (eg Good Friday) and I miss it I feel guilty. 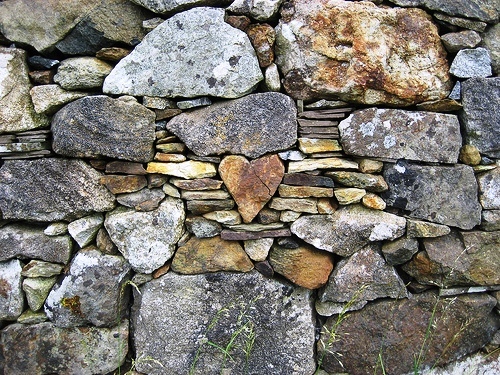 I must learn to acquire the patience and belief that you clearly possess. Although I occasionally still regret the six-year hiatus (“How much further ahead I could have been!” I chastise myself), I’ve more or less come to accept that what’s past is past. As you say, we writers must learn to have patience with ourselves – as well as forgiveness – for it’s a long road that we travel. You seem to have developed a methodical, disciplined approach in the gap years. i’d wish you luck on reaching your milestones, but I don’t think you need it. It’s hard for me to determine my writer age (a concept I had never considered until I read your post today). I wrote stories as a teen and even made it 100 pages into a novel when I was 12 or 13. I dabbled again in my mid-twenties for about a year. By then my “year off before college” had become 10 years, so I went back to school and got a B.A. Studying PR, naturally I wrote a lot, but I didn’t get back into fiction writing until late 2008, when I decided to write a novel. As for your writer age, it’s all quite arbitrary as to when you’d want to start counting from. I started keeping track because I like to be able to quantify progress, especially since, again, being do methodical and deliberate, I have notes and dates for every significant writing-related pursuit I’ve undertaken since about 2000. Take care, and good luck meeting your next milestones!